Synteko Hardwax Oil is the next generation in penetrating oil floor coatings. This can be applied to all timber floors, especially suitable for high traffic areas. Excellent wear-resistance, thanks to its high solids (100%) content, giving it good grain filling properties. This is a matte finish only. Synteko Hardwax Oil is made from renewable raw materials, cobalt-free and no solvents resulting in it being VOC free. In addition to its good water resistance properties, provided it is applied correctly, it meets the R10 classification. Another advantage is that this oil can be tinted with Synteko Tinting Paste. 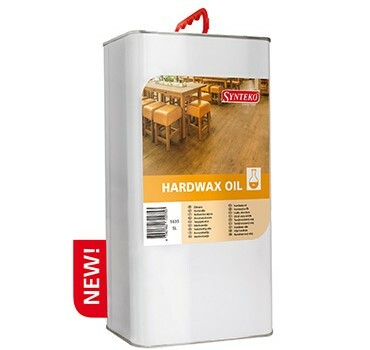 Synteko Hardwax Oil is similar to Synteko’s other penetrating oils being a non-film building finish. When applying this type of finish the object is to “work” the product into the wood fibres and not allow it to sit on top.The most common mistake with applying this type of product is either too much oil is left on the timber surface or insufficient oil is applied and the timber grain is sanded too finely. A distinct feature of the Synteko Hardwax Oil is that there is a micro layer of organic wax on the surface, that is not overtly visible to the naked eye.